Smart transportation is crucial for making the day of the big game a success. For two guys charged with figuring out what may be the single most vital component in successfully hosting a Super Bowl—transportation—Michael Morris, the transportation director for the North Central Texas Council of Governments, and Jeff Fegan, the CEO of Dallas-Fort Worth International Airport, seem remarkably relaxed about the challenges they face. Morris, who created the transportation plan the North Texas Super Bowl bid committee submitted to the NFL, says he’s never worked on an event with the scope of Super Bowl XLV. But he’s not worried, since even normal daily operations are like a Super Bowl for the region’s transportation system. “Six and a half million people traveling every day is kind of large,” he says. Fegan, chairman of the Super Bowl XLV Host Committee’s Aviation Action Team, has absolutely no concerns that his airport—and the 14 other regional airports that will see a spike in traffic during the week of the game—can handle what’s coming. Nearly a year before the game’s kickoff on Feb. 6, Fegan and Morris and the teams they oversee have ironed out their expectations for what’s to come, studied how previous Super Bowl host cities have confronted these demands, and started taking the steps necessary to pull it all off. Here’s a look at what’s on their minds. The host committee’s Aviation Action Team contracted with SH&E, a Virginia-based aviation consultant, to make a forecast for the effects of Super Bowl XLV. 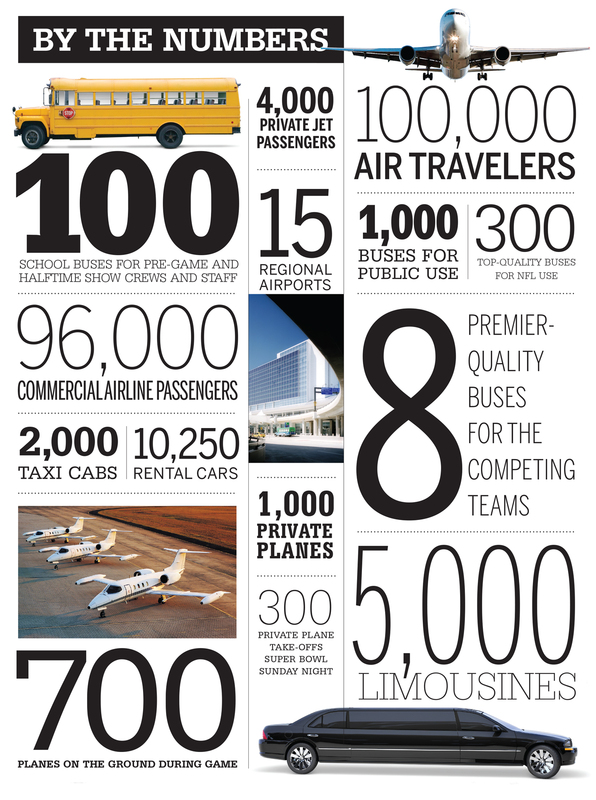 Their numbers indicate that about 100,000 of the 150,000-200,000 visitors expected for the game will arrive by air. Commercial flights will carry about 96,000 of them, while private aircraft bring another 4,000. Fegan isn’t worried about the impact on commercial traffic. DFW is the highest capacity airport in the world and operates most days at well below the capabilities of its five terminals, seven runways, and 174 gates to handle a spike in flights. Of more concern is accommodating the many corporate flights arriving. These are the planes most likely to carry CEOs and other business leaders that North Texas most hopes to impress. DFW Airport itself isn’t currently outfitted to handle much corporate traffic; in fact, it’s only able to accommodate about 30 private planes on the ground simultaneously. The Super Bowl forecast calls for as many as 100 planes sitting at the airport at once. That’s only a small portion of about 1,000 general aviation aircraft expected to arrive at one of the region’s airports sometime between the Wednesday before the game and the day after Super Bowl Sunday. About 700 planes will be sitting at DFW, Love Field, or one of the host of local municipal airports on game night—many of them waiting to take off again as soon as possible once the contest’s over. With 15 local airports accommodating passenger aviation traffic, there are plenty of options for bringing in a corporate jet—or even a helicopter. It’s one of the strengths that the region brought with its Super Bowl bid. The biggest annual sports event in America comes with grave security concerns for local, state, and federal officials. While Arlington’s police chief is heading local security efforts, outside agencies, including the FBI and NFL security, will become involved in determining what type of security perimeter will be established around the stadium. Only the very-privileged few will be able to park anywhere near the ball field on Super Bowl Sunday. Everyone else will have to park at distant sites and then make their way on foot through the security scanners to get into the celebration. Just how many parking spaces will be off-limits has yet to be determined, but planners are already making adjustments. An official remote parking location could be designated at Lone Star Park in Grand Prairie, about 9 miles away. The host committee has plans to spend $500,000 to allow fans to park there and load buses to take the trip to Cowboys Stadium. While he’s not yet certain, Morris expects Lone Star to be the only remote parking location provided for the game. Anyone looking to get in on available parking for the game will have to register for a spot through a special “Click and Park” web site that the NFL will set up specifically for Super Bowl XLV. The only way for spectators to secure and pay for a space, the site will boast software determining the best parking area depending on the area from which the traveler is coming and suggest a route to the stadium, Morris says. He hopes to sell rail and bus passes through the site as well. Rather than rely exclusively on automobiles to get people to and from the stadium, the host committee was aiming at press time to strike a deal with Union Pacific to allow the use of its rail corridor on Super Bowl Sunday. Thousands of fans would be able to board Trinity Railway Express cars at either Victory Station in Dallas or Texas & Pacific Station in Fort Worth to take them into Arlington. Riding the rail would be limited to passengers carrying tickets to the game itself. Once in Arlington, they would get on buses to travel the final mile to Cowboys Stadium. Because parking near the stadium will be extremely limited by a security perimeter blocking off many of the spaces, bringing in a sizeable number of spectators by other means is an important component of the plan. Morris says he “would be more nervous” about pulling off the logistics of game day if the train option weren’t available. “I’m using the Super Bowl to implement transportation projects that we should be implementing anyway,” Morris says. Working with the Regional Transportation Council of the NCTCOG, he pushed to take advantage of the opportunity afforded by this major event. For example, while the proposed deal with Union Pacific provides for only one day using the company’s rail corridor, it would establish a relationship with the railroad that could yield benefits for future collaborations. Among the road projects in Arlington that have gotten moving just a bit faster than they might have otherwise—thanks to being put on the clock by Super Bowl XLV—are construction on State Highway 161, completion of the major redo of Interstate 30 and its on- and off-ramps, and a new bridge for State Highway 360 at Division Street. DFW Airport also is preparing for increased Super Bowl general-aviation traffic by renovating the former American Eagle building on its northeast side for use as a new private-plane terminal. The $3 million project, which was awaiting the airport board’s approval at press time, would involve constructing a road to reach the building, as well as refurbishing the structure’s interior. If the project is OK’d, Fegan expects the work to be completed by the fall, and to increase the airport’s capacity so that—along with an existing, temporary corporate-plane building on the other side of the airport—it can handle as many as 100 private planes at once. Meanwhile, Arlington Municipal Airport, the airport closest to the stadium at 6.4 miles away, is constructing a new $4.9 million terminal that it expects to have completed shortly before the game. It will increase Arlington’s capacity for corporate traffic as well. Even Denton Municipal Airport, more than 47 miles away, is making upgrades. Leaders there are building a new $1.2 million taxiway to help prepare for more traffic. They’re also set to break ground on a 1,000-foot runway extension, though that project may not be completed in time for the big game in February. North Texas planners expect to learn from mistakes and difficulties they’ve observed at other Super Bowl sites. At Super Bowl XLIII in 2009, North Texas officials in attendance were staying in a hotel about 30 miles from where most of the major events were scheduled to happen in downtown Tampa. One evening they loaded into a mini-bus to drive to a pre-party, only to find themselves stuck in traffic on a causeway for more than two hours. By the time they arrived, the event was over. In Miami in 2007, tires were stolen off the cars of some NFL VIPs even as they were parked in a protected area. And the specter of an ice storm, like one that struck the 2000 game in Atlanta, is the ultimate nightmare scenario for the host committee and the league. Morris plans to combat these possibilities by planning down to the smallest details, designating precise routes for all traffic to take, and ensuring that all vehicles within the host committee’s control stick to those routes. “Redundant capacity” and back-up plans are also an important component of the agenda. In addition, commitments have been secured from the state to ensure a greater number of sand trucks are standing by in case of harsh winter weather. Other complications—like what happens if one of their passenger rail cars breaks down on the track—are being thought through, too. Another question is exactly how many tow trucks can be brought into service, at a possible cost of $500,000 to the host committee, and posted in strategic locations to assist any travelers that have breakdowns that could threaten to snarl the entire system. “We’d like to get that plan put to bed so that we can continue to test elements of our plan as the stadium is being used for other events,” Morris says. Every event thus far at Cowboys Stadium, from the George Strait concert that officially opened the venue until the big game in February, can be viewed as an opportunity for a test run of what’s coming Super Bowl Sunday. So far local officials are pleased with the ability of traffic to get to and from Cowboys Stadium. Morris plans to have bus drivers, car drivers, and train operators practice running their routes well before game day. That way there will be no surprises when the time comes. Back-up routes will be determined. Every bus officially associated with the event will have a GPS device loaded onto it, so that leaders in a central operations center will be able to keep plans on track and know when any of their drivers takes a wrong turn. “Everything we want to do for the Super Bowl, we’ll have tried out for the Paul McCartney concert and everything else,” Morris says. Another difficulty that North Texas leaders ran into during their sometimes-disappointing stay in Tampa was having a driver who didn’t know much about the local area. When their bus got stuck in traffic, the driver relied on GPS to tell him how to reach the destination, and he didn’t know enough to jump off the highway and seek an alternate route. It’s a nearly unavoidable problem because the demand for services like taxis is so high at major events like the Super Bowl that vehicles and drivers have to be brought in from outside the area to meet the need. Morris and NCTCOG hope to combat some of that by launching an “ambassador taxi” program. That program would work with local governments that license cabs to require drivers to attend training that makes them more knowledgeable about the region and teaches them to be better, friendlier representatives to visitors. Information about the public transportation system, options for arriving at the stadium and other venues, and details about the region’s airports all will be available on the North Texas Super Bowl XLV Host Committee web site months before the game. The hope is to give visitors a chance to educate themselves before they arrive in town. Just as important will be communication among various components of the transportation system as the plan is executed. Fegan, for instance, is working on a plan calling for buses that pick up groups of passengers to do so away from the terminal, and only once flight arrivals have been confirmed. “If we didn’t plan for it, our curbside would be overwhelmed by buses in the days leading up to the Super Bowl,” he says. A transportation operations center will be established, and that’s where you can expect to find Morris on the day of the game. All aspects of the system—roads, taxis, buses, tow trucks, and parking—will have to be carefully monitored to ensure that the meticulously developed plan is followed. Fans will begin arriving at Cowboys Stadium as early as about noon on game day and trickle in over several hours up until the 5:30 p.m. kickoff, aiming to view some of the pre-game entertainment and to see the ball field itself. But they’ll all want to leave at the same time. The same is true at area airports, where the biggest glut of traffic is expected on Super Bowl Sunday night and the following morning. Fegan notes that at the 2006 Detroit game, there were thousands of fans with commercial flights departing on Monday morning that flooded the airport and spent Sunday night there, rather than pay for another night in a hotel room. DFW is preparing for a similar occurrence, asking concessionaires to stay open late—as they do during weather-related emergencies—to serve the needs of overnight guests. Morris wants to use transportation elements to enhance what he calls the “World’s Fair atmosphere” of the Super Bowl. He has approached local companies in the transportation and aviation sectors about showing off some of their wares as additional attractions to out-of-towners. Bell Helicopter, for example, is testing the first civilian tilt-rotor aircraft in Arlington. Bell has been approached about flying its BA609 along Interstate 30 to land on top of the Dallas Convention Center, where the NFL Experience event will be taking place, several times in the days leading up to the game. And, with Lockheed Martin a major presence in Fort Worth, Morris would like to see fighter jets perform flyovers between Fort Worth and Dallas as well. Ground transportation will have a chance to get in on the fun too. Ideas include asking General Motors to show off some of the cars produced at its plant in Arlington by painting them in the color schemes of the teams participating in Super Bowl XLV. Fort Worth’s Burlington North Santa Fe Railway may be asked to paint locomotives on local tracks with Super Bowl colors as well. While none of this is sure to happen just yet, Morris believes in the big game as an ideal local showcase. “I think it’s a good way to celebrate sports, the private and public sector, and new technology, all in one big show,” he says.